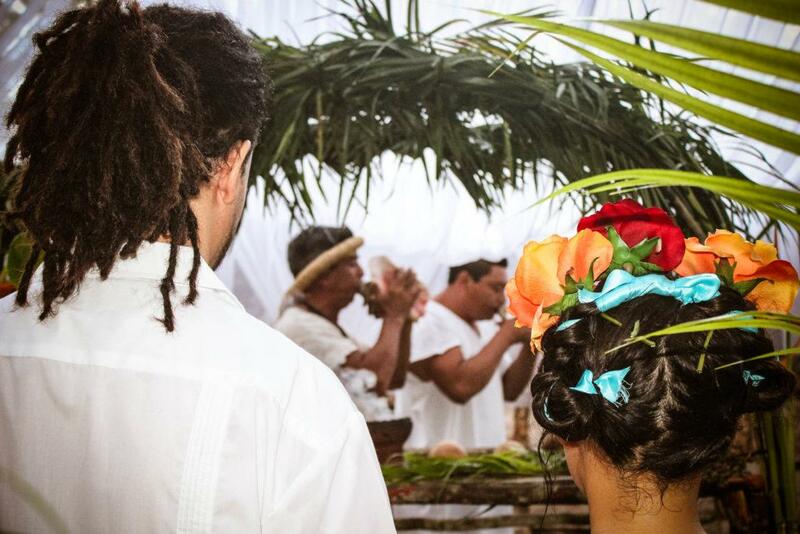 A Mayan wedding ceremony is a magical event and the Mayan New Year is a magical time. According to the Gregorian calendar it begins on the 26th of July and ends the following year on the 24th of July. The additional day in between (July 25th) is known as the day out of time. It is during this period the ancient Maya would perform a ritual for purification of the spirit, meditate, and reflect before the new year begins on the following day. 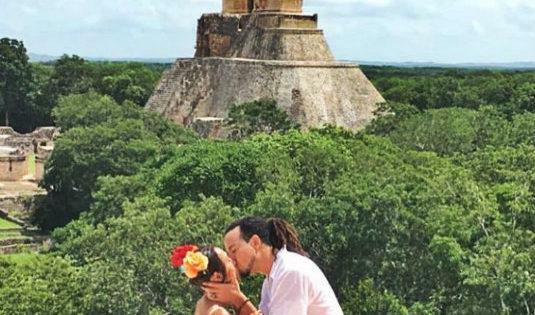 We decided to get married on July 24, the last day of the Mayan year. Our journey begins in the Yucatan. The Mayan wedding ceremony traditions started early in the morning with the rising of the sun. The smell of wet earth was in the air. It had been raining all night and our host Luis had stayed up late to weather the storm and make sure that our special day would be nothing short of exquisite. He was up early to make sure everything went as planed. His geniune care and excitement for our Mayan wedding ceromony is well appreciated. How could this not warm our hearts? 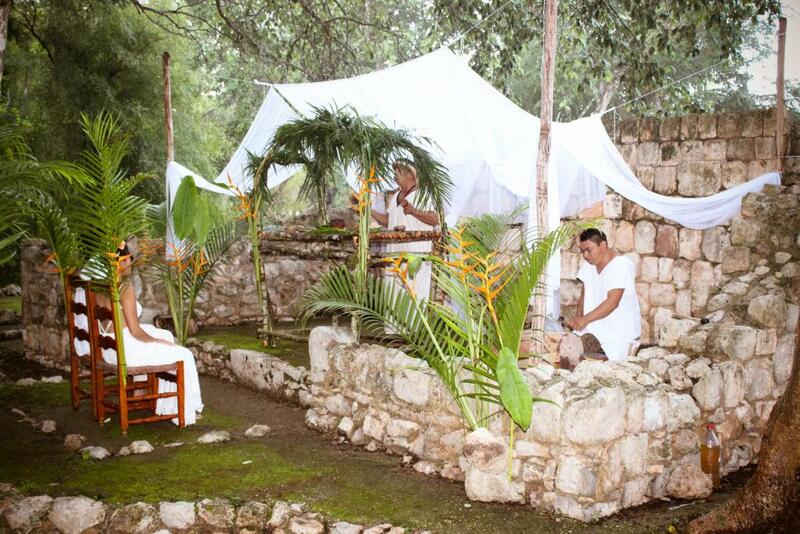 When we arrived at the archeological site that special morning, the ancient Mayan ruins were decorated in white linen. Everyone who attended wore white as well. It was just a small ceremony but what more would you expect from a run-and-gun couple like us? It was perfect. 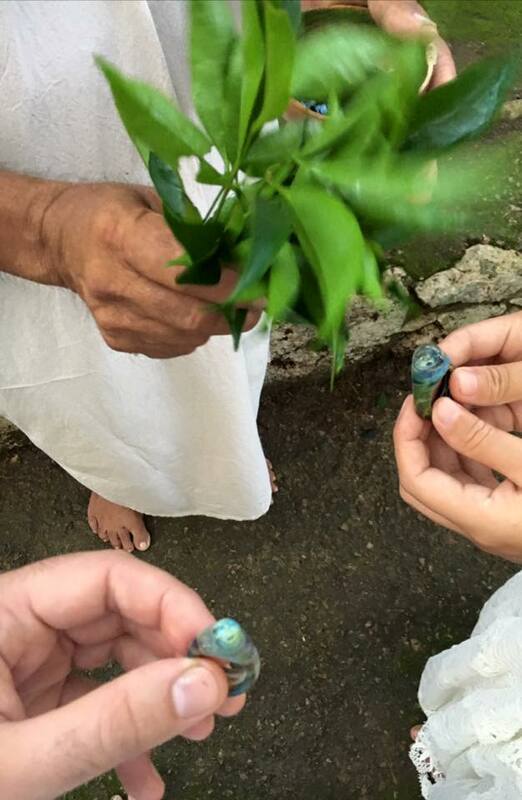 Before we began the Mayan wedding ceremony we took off our shoes to connect with mother earth. The earth was still wet. It was a surreal moment, we were in a magical land tying bonds for the rest of our lives, or as the maya say Mix Bil Kiin! The ceromony is orchestrated by a J’men or h’men (more commonly know as a shaman). The shaman for our mayan wedding ceromony is one of the most venerated in the Uxmal area of the Yucatan. The oral tradition was passed down by his father before him, and he only spoke only in the Mayan language so Luis, our host from the Hacienda Uxmal took on a dual role further assisting us by translating every word into the English language for us. We began by sitting in our chairs that were positioned side-by-side on the ancient Mayan ceremonial site. 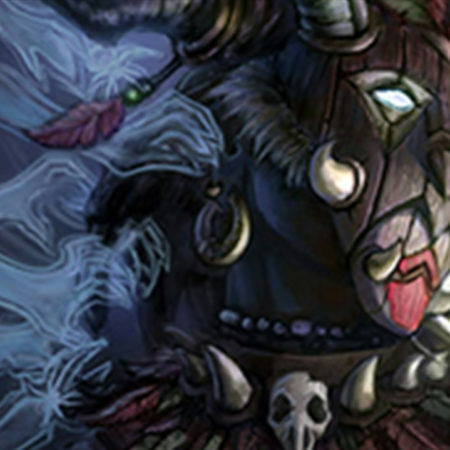 Our shaman was preparing for K’aam Nikte’. The Mayan Wedding K’aam Nikte’ is rife with symbolism. This spiritual act unites a couple with the cosmos and with Gaia (or mother nature). The ceremony balances us both in the material and non-material planes. The location of our ceromony, the ancient ruins of Uxmal are cleansed at the four cardinal points by the shaman who puts the sacred smoke from the Copal to use and follows with the ritual blowing the conch shell horn. 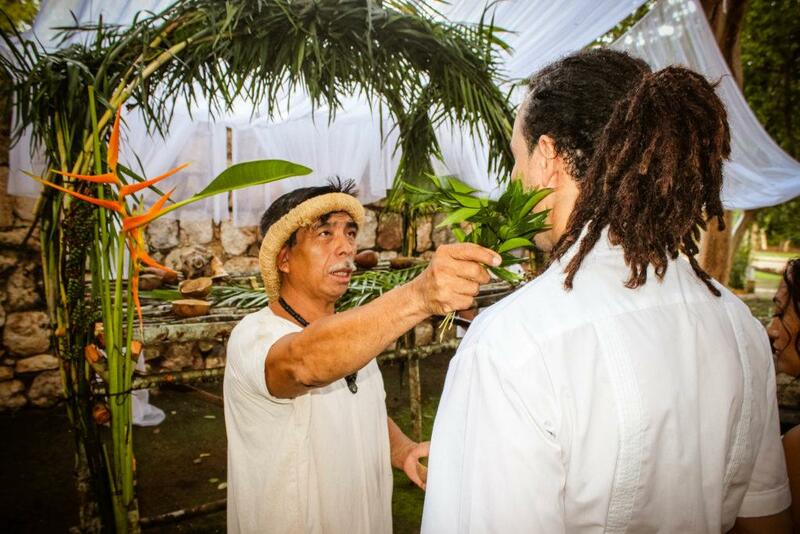 A special drink called Báalche’ is offered by the shaman to request the peace and tranquility of the couple. The drink may or not be alcoholic and it also serves to cleanse negative energies besides it’s biological purifying effects. The ceremony was very peaceful and moving, we soaked in the energy of the ancient Maya. We chose to have our dear friend, Ben “Tsunami” Lukas, who is also the talented glass alchemist featured in my husband’s debut film Egypt Through The Glass Shop, make our wedding rings of glass, designed to be reflective of the universe. To us the rings symbolize an alchemical transformation by fire and a move away from consumerism. My husband and I look on as the shaman proceed to blow the conch shell in all four cardinal points. I’m wearing a traditional Mexican hairstyle a la Frida Kahlo, I crafted the adornos myself. 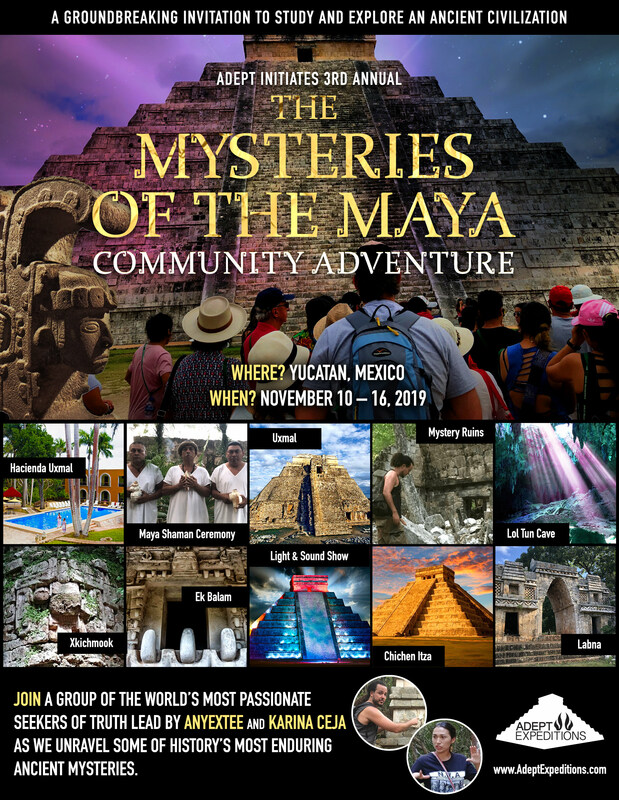 At this phase of the event we are seated on top of the edifice which is part of the authentic Mayan ceremonial site attributed to the archeological ruins of Uxmal. A huge boulder came crashing to the ground after falling from the sky. It left everyone present startled. This was unexpected but did not go unexplained. At the time I had no sensible explanation for it’s miraculous timing or why a rock is falling from the sky but the shaman revealed that this was a rare occurance but that it meant the Gods approved of our wedding. 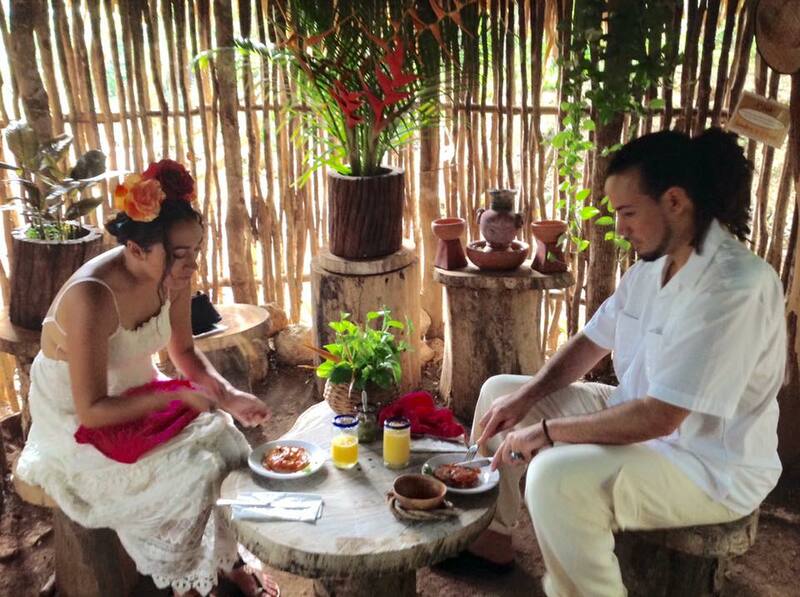 After our wedding ceremony we had a traditional Mayan breakfast inside a Mayan hut. Did you know that the Maya used a different hut to cook in and another to live in? They made a separate hut to cook in to let out the smoke so the gaps inside these huts are wider and not suitable to live in since the air or rain can come in through the cracks. Needless to say that our breakfast was so delicious! For our meal we had hot cocoa as the mayans had which had no milk in it only water, the most delicious potatoes with a red sauce that was not spicy but left your taste buds wanting more, the cutest minnie breads, including conchas, and their special made marmalade which is the best marmalade I have ever tasted! A local woman named Rosa cooked for us and taught us how to make hand made tortillas – which we ate afterwards. This hands-on act of making the very food we eat provided us with an intimate moment and memorable mayan breakfast. Here we are on top of the ruins at Uxmal in the Yucatan with the Magician’s Pyramid in the background. 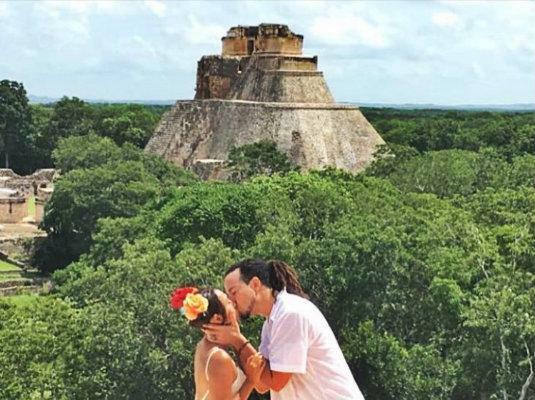 Since we decided to have the traditional mayan ceremony in tandem with the rising sun, it left us plenty of time after the wedding to explore our favorite ancient sacred site – Uxmal. The Uxmal ruins are located right next to the Uxmal Hacienda. All of Mexico is beautiful. 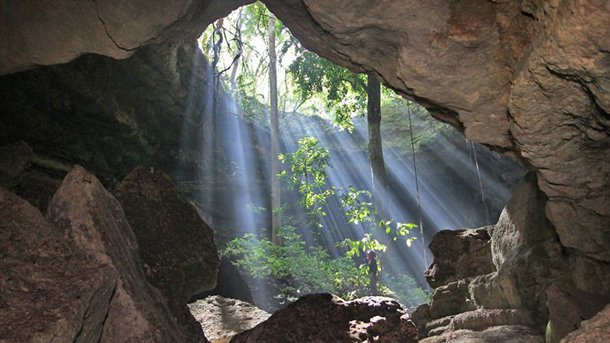 Your eyes alone will do it no justice but the Yucatan is the jewel of the land. To get married here is a beautiful, magical, and unforgettable experience. Everyone in the Yucatan is kind and so friendly that you’ll feel like you are part of their extended family. This moment in our life will forever be in our hearts, and in the history books! If you would like assistance with arranging your very own traditional Maya wedding ceremony in the Yucatan you can contact me here. Post a comment below if you have any questions and I’ll be happy to help you. 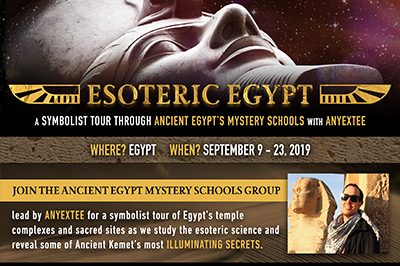 Anyextee is an esoteric researcher, author, public speaker, filmmaker, artist & tour guide called to investigate the ancient mysteries, metaphysics and mysticism. 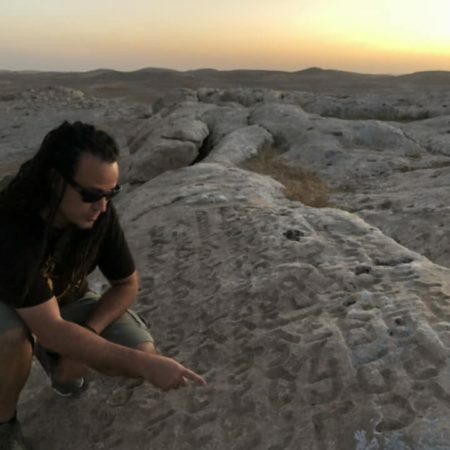 He transformed his passion for exploration into an esoteric tour company dedicated to providing travelers with more meaningful experiences. 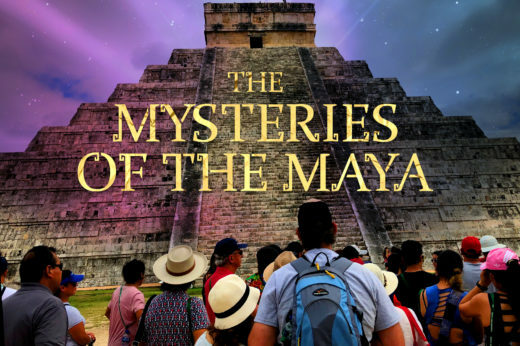 He is the producer of The Sacred History of the Rosicrucians and the founder of Adept Expeditions, Adept Initiates and Ancient Egypt Mystery Schools and leads tours through the Yucatan, Mexico and Egypt.